I thought it would be useful to compile a list of flash memory compatible with DualOptiboot and other OTA capable bootloaders. So the plan is to pin this message and add SPI based Flashmemory typenumbers/brands and how they are connected to the relevant OTA bootloader. I know most bootloaders require SPI based flash memory. I have found 1 article describing a bootloader which allows the use of I2C EEPROM (http://www.rotwang.co.uk/projects/bootloader.html). But this is outside scope of MySensors for the moment. Allows a maximum sketch size of 64Kbytes. People with atmega1284p and 130KByte sketches are out of luck. As you answer I will add this info to this first message. Good topic as I actually can't find documents related to OTA. I want to flash dualoptiboot bootloader as I am using an eeprom but which application do I use to flash my nodes ? @ahmedadelhosni You need to flash your atmels with an usbasp and dualoptiboot or sensebender bootloader but I think you already know it . Then to OTA your nodes you can use MYSXController, or maybe there are some controllers able to handle this too, I don't know as I use mysxcontroller for this. In theory there is nothing holding back on using a 4 or 8Mbit SPI flash. DualOptiboot ony supports reading the first 64Kbytes.. The rest could in theory be used to store sensor data, display data (in case you have a graphical display, and have some pictures to show). So in conclusion, any OTA application shall work. The bootloader is responsible for flashing. Whether to copy my code to flash then after that copy to my atmega if I am using DualOptiboot or just use MyScontroller which as far as I remember does not copy to extenal flash. I read @scalz new post. It answers my above questions. For dualoptiboot, you need to compile the library with Ota support (and have an external flash connected). The advantage here is that it's radio agnostic. Mysbootloader is only usable with nrf24 radio. Controller shouldn't care about which bootloader you have. The library uses same Ota transport mechanism as mysbootloader does, when used together with Dualoptiboot and external flash. Summary: MYSContoller is used for OTA updates regarding the bootloader used. The bootloader is responsible to handle the packets sent by copying it to an external EEPROM and then doing a reset, this is DualOptiboot. The other scenario is using MYSBootloader where the bootloader resets the Atmega and the bootloader handles the received packets with the new firmware. Correct me please if I am mistaken. The other topic which I guess is important to be included here is using Signing with OTA. Do both bootloaders support Signing during flashing ? The answer is in the below link. I would like to keep this discussion on the Hardware topic: which flash memory can be used for OTA ? All other - relevant no doubt - questions you raise deserve a separate discussion in the Development topic. They are not hardware related. I do not have a list of working flash types but did a search for them. See below a list of what I found and think could fit. I also added where the specifications differ from the AT25DF512C. As I do not know exactly what is important from the specs I would appreciate it if someone with more knowledge on the topic could help to differentiate about what's important and what's not. At least if one of the chips is not usable we can add them here, too - in a negative list. So we have information on those working and those who are not working in one place. Disadvantage of all of the above is that they seem to need far more than 2.0V to operate (bad for a battery sensor). I think the AT25DF512C is best for the job but unfortunately I couldn't find a distributor in Europe. Digikey and Mouser (only places I know where to get it) do bill you $20 for shipping to Europe which I would like to avoid. SST25 Series flash mentioned by Gulpman as 1st and 2nd Alternative are currently not supported, because the dont support pagewriting with opcode 0x02. Instead they support Automatic Address Increment Word writing (opcode 0xAD). I updated teh SPIFlash.cpp and .h so they will take care of that if #define MY_SPIFLASH_SST25TYPE is set somewhere. 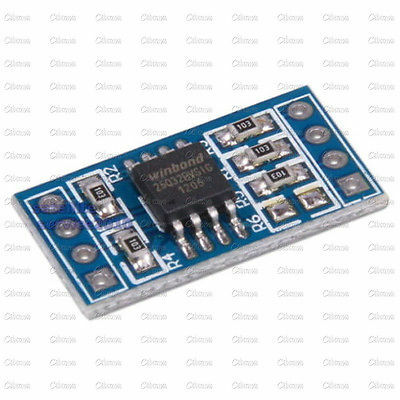 I tested with this SPI Flash: http://www.reichelt.de/25PF020B80-4C-S/3/index.html?&ACTION=3&LA=446&ARTICLE=137365&artnr=25PF020B80-4C-S&SEARCH=25pf020b80 which is of Type SST25PF020B-80-4C-SAE (2MBit) and working now. I only hat a short look at the ISSI and Winbond flash Datasheets mentioned by Gulpman before. At first look I think they both could work with the current Mysensors / SPIFlash Version becuase they support Pagewriting with opcode 0x02 and seem to implement the other relevant opcodes. However I did not test..! Did you test the SST25 together with DualOptiboot? Or is it only the writing from library that is tested? I tested the complete chain with SST25. I.e. I prepared two sketches and uploaded them via OTA with MYSController and checked that the sketch changed via presentation Message. Dual Optiboot does not need modification because AFAIK it only reads from Flash, which works the same way for SST and other Flash Types. What about atmel AT26DF series(4/8mb)? It's compartible with AT25DF series pin to pin. I think that DualOptiboot is writing to the external flash, after a successful upgrade of the internal flash, as it tries to delete the image stored there. But I haven't looked that much into the design of dualoptiboot.. Just forked it, and adjusted bits here and there, to be suitable for the sensebender So I don't know what commands it uses to erase the data. @Koresh please post a link to the datasheet. You can also check on your own: check if your spi-flash supports all commands listed in the SPIFlash.h defines. Of cause obvious things such as pinning and supply voltage range must also be checked. A caveeat I fell into, was that opcode 0x02 supports byte and pageprogramming for some SPI-Flash types but not for all (e.g. SST25 does not support pageprogramming but therefore has the AAI Wordprogramming feature). interesting..on my side I like the AT25DF512 for its voltage range 1.65v min and its low power mode 0.2uA in deepest mode. better for low power batt nodes I think..too bad there is not something like this in i2c format but I guess these flash types prefer faster spi transfer..
Hard for me to determine but is this different from AT25F512N? The AT25F512 (from Atmel?) is quiet different from the Adesto AT25DF512. As far as I can see the Atmel one seems not to have a Block erase command (32k/64k), which is used in MySensor AND in Bootloader code. If I'm not wrong with that assumption (and I dont think I am), I would NOT recommend to use the Atmel AT25F512. To all: please provide links to the Datasheet if you expect help... Its tedious to search them every time. Gulpman did great preparation work in his post above. Edit: Never mind what I said in this Post. I got confused with sectors pages and blocks ... I'll write some more later. It seems that atmel is calling it "Sector erase" instead of "Block erase". Hi I just wonder if this Spansion, S25FL208K0RMFI040 could be used? About the AT25F512N wich was proposed by @AWI: tbowmo was right, I got confused by Sector, Page and Block erase. Like tbowmo said atmel does call blocks sectors... The AT25F512 does not support Block Erase 64k, which is defined but AFAIK not used in SPIFlash.cpp BUT it is used in the Bootloader if the "Imagesize" is > 32k. But I dont know how Image size is retrieved. Also I think for an ATMega 328p the image size should never be >32k. So this Flashtype could probably work as long as the image size is below 32k. I'd expect the Bootloader to crash or fail when program size is >32k. About the S25FL... @bjacobse proposed I see the problem that it does not support the Bock Erase 32k opcode which is used in SPIFlash.cpp and Bootloader. Both must be changed when S25FL... should be used. (I would emulate the 32k Block erase by 8 times 4k Block erase.) However remember that Dualoptiboot must also be altered which requires "non-arduino" programming and some work / knowlegde about makefiles / compiler/linker settings in IDE. Thank you Dirk for checking the flash I asked about. I have noticed that the company I'm working is using this device. And then I hoped I could buy it from the company to a hopefully reduced price compared to retail price for private. Hey, guys I am currently looking for a (cheap) solution for OTA available in germany. I wanted to use the AT25DF512C-SSHN-B but the only source I could find was aliexpress which only sells 150 pcs at a time (a little too much, although future proof for me I guess ). I did not really understand this thread so far: is there another model that works with my sensors? Or do you by chance know a place where I can get some of the AT25DF512C-SSHN-B ones here in europe? Thanks! Well not in EU, but you can order from DigiKey or Mouser if everything else fails - thats where I order my parts. EDIT: And I live in DK - maybe worth mentioning. Thanks, but both have shipping costs of abount 20€ (if you pay <50€ overall). Or is there a way around it? I also found SST25VF020B‑80‑4I‑SAE and 25VF512A33-4C-SA flash modules in german stores though. Would they work too? I'll give the datasheets a look, of the devices you mentioned. @LastSamurai The SST25VF020B... should work fine with the 2.0 developversion and #define MY_SPIFLASH_SST25TYPE set. It seems to be very close to the SST25PF020B I used. However keep an eye on the even more limited voltage range of the SST25VF Type which needs at least 2,7V which would be a problem if you want to power your circuit directly by 2xNiMH Batteries. The SST25VF512 needs also 2,7V but additionally does not support the 64k erase command (see my comments on that issue some posts above where I wrote something about the AT25F512). A question, why don't use an EPPROM SPI 25AA020A or 25AA512? They works between 1.8 and 5.5V. Anyone knows if it is fully interchangeable with AT25DF512C? I cannot see any difference from the datasheet. The pinout is the same. Any news with the EEPROM compatibility and the new Mysensors version 2.0? Would AT45DB041E be a good choice as a OTA flash? I see it's in the schematics for the new Sensebender Micro mk2. Seems these are only 2K in size. I would like something similar though! Did you ever figure out if this works with Optiboot for OTA flashing? I must admit that i'm very confused at this thread, it was setup to advise of other Flash IC's for us to use but there seems to be no 'solid' alternatives that you guys have suggested. For me, living in the UK, its near impossible to grab any of the AT25DF512C-SSHN-B without paying through the roof for shipping. I can see that AT45DB041E is JEDEC compliant but that is as far as i can go with knowing if it will work. Flash architecture is way out of my depth right now. Hello. This chip (AT45DB041E) has no erase 32kb command (0x52), status read command has a strange opcode too (D7h). So it is no trivial task to use this chip. So OTA library will call erase 64kb command instead of erase 32kb command. It is very easy. You should use Bootloader which calls erase 64kb command instead of 32kb command. Bad news. It is not an easy task and you should recompile dual optiboot and burn it. Good news. I've recompliled dual optiboot and all my nodes will burn with it by default. My changes in bootloader are very simple but it sutable for my boards. We update it many many times and the process is absolutely bulletproof (especially after Tekka's update ). @Koresh - Thank you for explaining this to me. I think i understand this a little more clearly now. Like i said, i've never dealt with flash so its all a grey area for myself. I'm currently looking at recompiling MYSBootloader for use with an 8Mhz crystal instead of this work around. The whole reasoning behind me asking this question is simply because i wanted OTA updates on a battery powered node. Now, this means i need OTA updates on 3.3v, but my MYSBootloader nodes require 16Mhz crystal to work. So its either use 16Mhz on 3.3v (while it works, its not the correct solution) OR to get a bootloader working with an 8Mhz crystal setup. I chose the later, and therefor its either recompile MYSBootloader to work with 8Mhz OR to get a flash IC on the board to allow for Dual Optiboot. At the moment i'm toying with the idea of going the software issue route and attempting to recompile MYSBootloader for 8Mhz (just need to workout what to change for the recompiled version). Seems a little easier and cheaper than going the route of flash considering my location and not being able to get my hands on the recommended/mostly used flash IC. @Koresh what about Winbond W25X40CLSNIG - the same used by Moteino? It seems to me this could be a good match? @tbowmo Thomas, what do you think? @Koresh I have just tried it and it works nicely. I found the following one which is now offered in a breakout board. I read the datasheet and compared the characteristics and instruction set with the ones for W25X40CLSNIG. I also checked against the SPIFlash.h file in github. To me everything seems consistent and am planning to order one to check. Does anyone see something what might prevent it from working? I'll report on what I find - it will be in some weeks since the delivery time is long. What do you think would be the best solution to fit a flash chip on the easypcb board? While the ebay seller shipped for free, Aliexpress would charge me 1.24€ for shipping to my country so the total price would be 2.63, significantly more expensive. @gohan I do believe mysbooloader has signing support. @Anticimex does it? How about encryption? so far MysBootloader is available for nrf24 only. And for rfm69 FOTA, it's dualoptiboot bootloader based (from Lowpowerlab) which needs a flash ic. It has been answered by tekka in another thread, but I don't think there is an eta for rfm69 MysBootloader yet..as the todolist isn't short ! @manutremo I am getting trouble with W25Q32B. Can you help me to get success? I am struggling to get jedec id for this chip. @jkandasa happy to see that you solved it. In case it matters, I didn't need to add the second line. Hi, old thread but I hope a question not too far off the mark. I'm using Easy PCB nodes and looking to use OTA on the reverse side. I'm having some issues finding a source in Australia for the SPI chip mentioned, I am seeing this one very easily available. From the data sheet on the page, it appears to be pretty much the same, just the lower end of the acceptable voltage is up to 2.6V. Any thoughts welcome if you can see if it would/wouldn't work, my tech knowledge is limited on this sort of thing. @p359 - not really good at these external flash either... but as you said its a 2.8-3.6v chip meaning you limit the EasyPCB to a regulated 3.3v 8mhz Pro mini. Battery operations will be hard to achieve (not impossible though). But since you are aiming for OTA i guess you wont be using sleep/battery. for how to write to the chip, im not the person to ask/answer since this is quite new to me but it seems like a fair price so maybe worth a shot. It is possible to use battery, just use smartsleep instead of sleep to allow a little extra time for the controller to send the OTA update command and you can also use LiFePO4 batteries that work exactly in that voltage range. Not making too much headway with this. Chips arrived, soldered on the the reverse side of the easypcb. Not able to get any sign of the flash being seen. One odd thing, the physical solder pad for the flash chip, pin 6 on my boards isn't connected to sck of the arduino pin 13 at all, just a bare solder pad. I've bridged this with wire, still no luck. Hmmmm...! More experiments ahead, good fun!